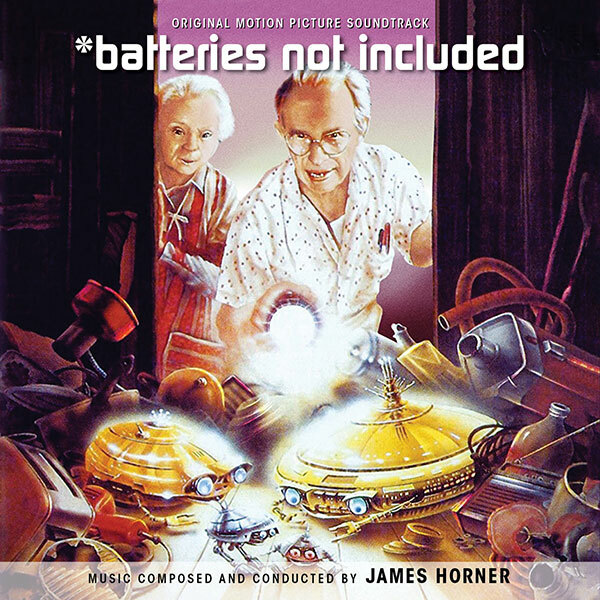 Intrada's latest release is an expanded soundtrack for the 1987 Universal and Amblin film *batteries not included. Composer James Horner wrote 90 minutes of music for the film, about half of which appeared on the MCA album issued at the time of the film's release. Horner composed a portion of the score for big band, reflecting the generation of the elderly folk living in the film's NY apartment building setting. The second facet of the score is the traditional symphonic fantasy style Horner had made his mark on during the '80s. At times the two styles intersect, as fantasy and reality interweave throughout the film. This release features Shawn Murphy's original two-track stereo mixes. The new album includes several substantial cues being heard for the first time, not only because they were omitted from the initial album but because they were also omitted from the film. And of course the album features music in the film not on the original release. Since two CDs were required to present the entire 90-minute score, there was enough room to include the original MCA program as a bonus. The story focuses on a fading property in New York City’s Lower East Side. Landlords Frank and Faye Riley (Hume Cronyn and Jessica Tandy) run a diner on the ground floor and rent out apartments above. But an unscrupulous real estate developer has torn down the rest of the block and only the Rileys and their tenants stand in the way of his major construction project. The ultimate destruction of the building seems inevitable. But help arrives in a most unexpected fashion—two small spaceships that seem able and willing to fix things. These seemingly sentient machines make a nest on the building’s roof and, using bits and pieces of metal, give birth to three “children.” Soon, a lively relationship springs up between the spacecraft family and their hosts. Meanwhile, the impatient developer decides to surreptitiously torch the building. The resulting explosion leaves only an empty shell. But the Fix-its return and restore both the building and all the residents’ lost hopes. One of the best things, I have heard all year and you know I have had a rough year!